Patna Pirates is the Patna city Franchise and currently Champions of the Vivo Pro Kabaddi League. Owned by KVS Energy and Sports Limited, Patna Pirates believes that the spirit of the pirate is the spirit of not letting go, of using the environment to advantage, of striking when the enemy is least aware. It is named not after the criminal meaning of the word but after the Greek word 'peirin' which means "to attack". KVS Energy and Sports Pvt Limited, is owned by Rajesh Shah, Co Chairman and Managing Director of Mukand Ltd and his son Mr. Kaustubh Vir Shah. Mukand is India's leading integrated specialty steel producer and a manufacturer of heavy industrial machinery. Mr. Rajesh Shah is a third generation industrialist who has held several board positions in large Indian Public sector Units as well as multi national companies. He is the Past President of the Confederation of Indian Industries, and the Young Presidents' Organisation. Mr. Shah is also a keen follower of sport and is himself a fitness enthusiast. Patna Pirates is his first venture into sporting territory. With a fan base of 6.95 lakh verify followers on Facebook, 278k on twitter, 58.4k on Instagram, Patna Pirates had a fairly successful Season 1 and 2(3rd and 4th position respectively) became Champions of Season 3 and Season 4 and have again re-created history by winning the Pro-Kabaddi Season 5 Championship, thus becoming the only team to have a hattrick in consecutive season wins. The aggressive squad is led by Pradeep Narwal, Coached by Ram Mehar Singh. The Pirates anthem which is penned by the great Prasoon Joshi, put to music by the much loved Late Aadesh Shrivastava and rendered by none other than Kailash Kher has become a big hit not just among the Pirate fans but across all sport fans. 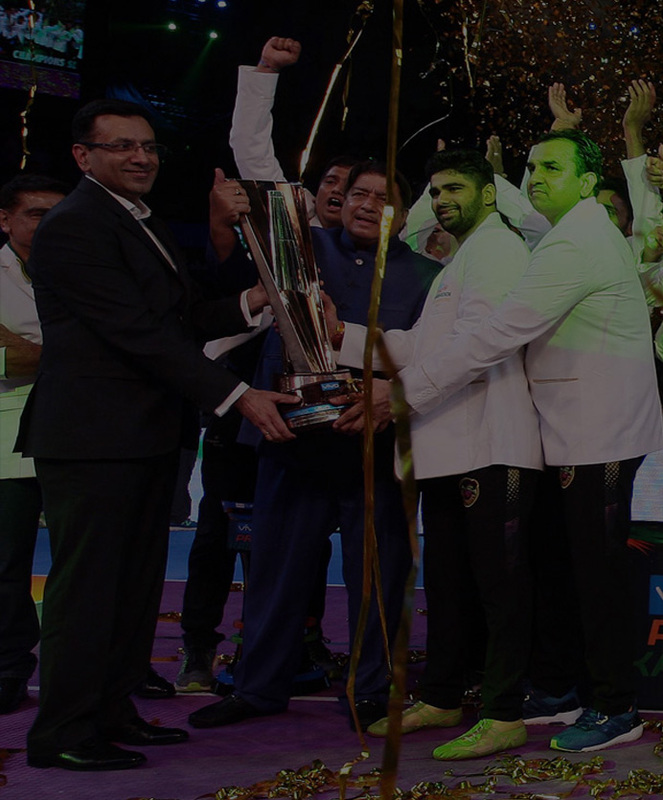 The Pro Kabaddi League (PKL) is promoted by Mashal Sports, a company promoted by Anand Mahindra and Charu Sharma. At the end of Season 1, August 2014, Star Sports acquired majority stake in Mashal Sports. PKL Season 1 was held in July 2014, Season 2 in July 2015, Season 3 from January 30 - March 6, 2016, Season 4 from June 25 - July 31,2016 and the latest season 5 from July 28 - October 28, 2017. PKL is played in a caravan style across 8 franchisee host cities with each team playing 14 matches each before the play offs.